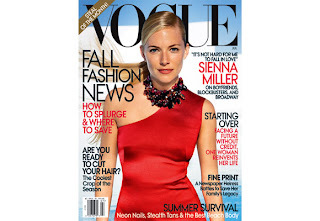 July Vogue goes to Sienna Miller in a futuristic photo shoot that captures all of her good angles. Sienna is dressed fabulously in one shoulder pieces and created angles through cut outs which contrasts beautifully with the curvature in the location. I love the simplicity of the clothes.. they make such a statement without having a lot going on. Sienna is promoting her new film, G.I. Joe, and for anyone that has written this style icon off can take listen from Steven Spielberg who says after seeing her new film, "That's Sienna Miller? Wow, she really pops." Yes, thank you Mr. Spielberg, we've known this ever since Sienna stepped out in her Boho Chic fabulous outfits. We needed no further convincing.